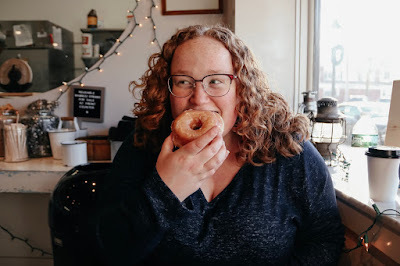 I'm just going to go ahead and say it - yes...the donut was delicious, thanks for asking! The answer to that fantastic question person inside my head is that I get anxious almost every single time I open up this thing. It gives me nothing but a pit in my stomach of impending doom, guilt, with a dash of ugh. Isn't that lovely? Probably not what you wanted to hear and if it is, well then...you're not nice. But seriously, this thing gives me more anxiety than I usually like to admit and it's something I don't think I'll ever bring back full time but who knows. For now, though, I guess I'll continue to come and check in every once in a while to give y'all an update. A lot has changed since I started this blog at 15 years old. It's been 7 years and I still remember the first time I wrote a blog, I was so excited and terrified of people finding out I did this, and I don't regret one moment of it. I think about blogging often and how maybe I should have kept up with it or I should have pushed past all the fear that I associated it with. But I didn't and I'm okay with that because it was a part of this crazy journey I've been on. I mean seriously, in front of all of you, I got my first job, graduated high school, started college, transferred colleges, turned 21, met some of the most amazing people, lost people and pets, and now I'm getting ready to graduate college and go to grad school. I don't know, but it just felt right that I should let you all know what's going on. So to wrap this all up, I want to say thank you for reading this little space on the Internet I've been fortunate enough to hold for so many years. And I promise to keep you all updated on my life and all the boring things that happen in it! Haha! Maybe I'll talk to you soon, maybe I won't. Either way, I hope you have a fantastic day. P.S. Yes, I did hide all my old posts. You're welcome for less cringe existing on the Internet, no one ever needs to see some of those again! Haha! Haley Pereyo reporting live from the trials and tribulations of adulthood. Coming up I have some tales of my past, as well as some thoughts about where I think I'll be in 5 years. Nothing but anxiety and lots of Gilmore Girls in the near future, isn't that right, Jerry? And now, back to you in the studio. © 2015 Bits of Wit. Victoria Template designed by Georgia Lou Studios All rights reserved.